French Comment va la vie à l’ère du numérique ? Spanish ¿Cómo es la vida en la era digital? German How's Life im digitalen Zeitalter? Italian Come va la vita nell'era digitale? Korean 디지털 시대에서 삶은 어떠할까? Portuguese Como Está a Vida na Era Digital? Russian Какова жизнь в цифровую эпоху? How's life in the digital age in Australia? How's life in the digital age in Austria? How's life in the digital age in Belgium? How's life in the digital age in Canada? How's life in the digital age in Chile? How's life in the digital age in the Czech Republic? How's life in the digital age in Denmark? How's life in the digital age in Estonia? How's life in the digital age in Finland? How's life in the digital age in France? How's life in the digital age in Germany? How's life in the digital age in Greece? How's life in the digital age in Hungary? How's life in the digital age in Iceland? How's life in the digital age in Ireland? How's life in the digital age in Israel? How's life in the digital age in Italy? How's life in the digital age in Japan? How's life in the digital age in Korea? How's life in the digital age in Latvia? How's life in the digital age in Lithuania? How's life in the digital age in Luxembourg? How's life in the digital age in Mexico? How's life in the digital age in the Netherlands? How's life in the digital age in New Zealand? How's life in the digital age in Norway? How's life in the digital age in Poland? How's life in the digital age in Portugal? How's life in the digital age in Slovakia? How's life in the digital age in Slovenia? How's life in the digital age in Spain? How's life in the digital age in Sweden? How's life in the digital age in Switzerland? How's life in the digital age in Turkey? How's life in the digital age in the United Kingdom? How's life in the digital age in the United States? While more and more people in OECD countries have access to digital technologies, a digital divide in the use of digital technologies persists. Inequalities along age, gender, and socio-economic lines in the use of digital technologies mean that certain groups are better able at using digital technologies for higher well-being outcomes in many dimensions, such as jobs and income, health, work-life balance and social connections. In additions, the risks of the digital transformation may also fall more heavily on people with lower levels of education and skills. 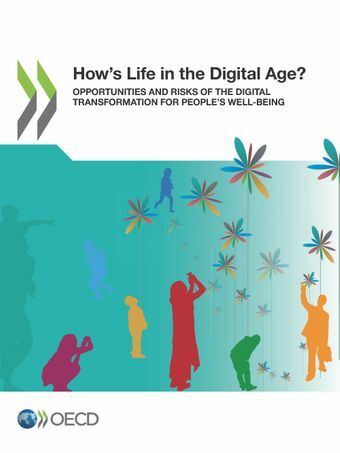 Therefore, while the digital transformation offers opportunities for people to attain higher levels of well-being, it presents an overarching risk of increasing inequalities in well-being outcomes. Beyond pure digital skills, emotional and social skills associated with safely navigating the online world are necessary to fully benefit from digital technologies. This “digital literacy” allows people to harmoniously combine their digital and real lives, and avoid potential mental health problems associated with abuses of digital technologies. The extreme use of the Internet has been associated with a number of mental health risks, and the passive use of digital technologies has also been shown to have negative effects on subjective well-being outcomes.